Amar G. Kapoor is an unemployed but talented youth who was born in Lahore, and is the grandson of renowned Lala Kedarnath. 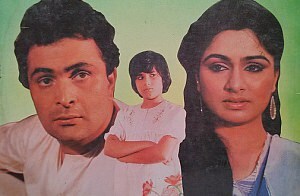 He re-locates to Delhi in search of employment as a singer/dancer, meets with Sangeeta, whose mom, Rukmini, owns and runs a post hotel, gets a job there, falls in love with Sangeeta, and much to the chagrin of Rukmini, both get married, and soon become parents of twins, Kiran and Jyoti. The marriage does not last long as minor issues bludgeon, leading to accusations that Amar is having an affair with the daughter of the hotel chef. Amar decides to take Kiran and moves out. Seven years later Amar has accomplished himself in Bombay, runs an advertisement agency, while Kiran is studying in school. While on an outdoor trip, both twins meets, and decide to change places, in order to bring their parents together. Watch what happens when Rukmini finds out and is all set to stop this from happening, and in order to complicate matters even more, Jyoti finds out that an..